Starring: Mark Wahlberg, Seth MacFarlane. Co-Starring: Mila Kunis, Joel McHale, Giovanni Ribisi. Taking place in Boston, the movie starts in a flashback to the 1980’s. An eight-year-old John Bennett’s Christmas wish and the resulting miracle starts as an ordinary gift, a “Teddy Ruxpin-like” teddy bear that magically comes to fully animated life after John’s wish! This bear, appropriately named Ted (Seth MacFarlane), becomes an instant celebrity who appears on such talk shows as “The Tonight Show” with Johnny Carson. 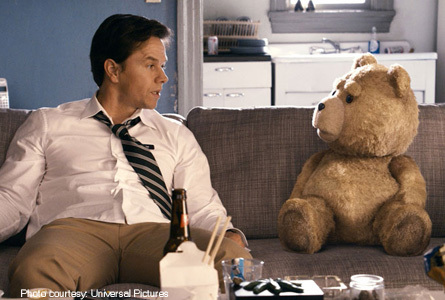 Actor Mark Wahlberg with Ted (voiced by Seth MacFarlane). As the boy, John (Mark Wahlberg), enters adult hood his best friend Ted has remained at his side and even consoling him during thunder storms with a quirky song made-up to drive John’s fears away. The biggest problem is Ted has become a social crutch for John who admits to getting through the awkward stages of high school due to having Ted’s friendship. However, when John meets the girl of his dreams, Lori (Mila Kunis) his crutch Ted turns more into an annoyance. Lori points out to John the fact that Ted has become a hindrance on his ability to move forward in his life and citing his job as a car rental agent a step in the wrong direction. Ted’s days of hanging-out with John on the couch as they smoke pot and eat chips are numbered when John is faced with the ultimatum of keeping his girlfriend or making Ted move-out. Ted is now faced with getting his own apartment and a job. When he unintentionally lands a cashier position at a local supermarket he equates his circumstances with that of other former child celebrities, specifically those from the 1980s sitcom “Different Strokes”. John’s separation from his best friend doesn’t last too long and his relationship with Lori is even further strained when Ted has a must-come and see invite to his apartment party featuring a childhood hero and icon – “Flash Gordon” himself! A random life or death emergency with Ted drives the story into a new turn that takes audiences on a continued overall refreshing adventure. Surprise cameos came from Ryan Reynolds (Green Lantern) who plays a gay lover, Giovanni Ribisi (Friends, My Name is Earl) whose creepy character was spot-on, Patrick Warburton (Rules of Engagement) as Wahlberg’s co-worker, and up-and-coming actress Jessica Barth (Family Guy) plays a grocery store cashier who’s Ted’s love interest. Directed by Seth MacFarlane, As a fan of Family Guy, I really enjoyed this movie it is explicitly funny. Being from New England and a child of the 80’s the opening scene was definitely a welcome blast from the past. The CGI animation is great and it realistically transforms this fuzzy innocent looking bear into a down-right vulgar, and foul mouthed male of the human persuasion. 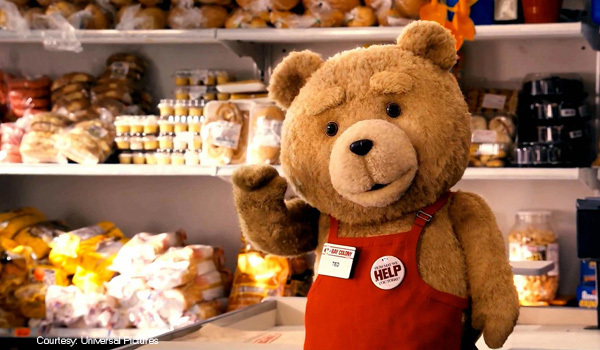 It really brought Ted to life and pulls the viewer into the story while forgetting that he is not real. In some scenes I almost felt like I was there hang’n out with John and Ted. The story line itself is a unique buddy movie to say the least, about the lingering consequences of a childhood wish come true only to grow up and turn into an adult life nuisance. Who wouldn’t want a best friend like a “Teddy Ruxpin-esque Bear” that sounds like Peter Griffin and can also walk, make off color remarks, drink and smoke too? The cast of “Ted” includes: Mark Wahlberg (as John Bennett), Seth MacFarlane (as the voice of Ted), Mila Kunis (as Lori Collins), Joel McHale (as Rex), Giovanni Ribisi (as Donny), Patrick Warburton (as Guy), Matt Walsh (as Thomas), Jessica Barth (as Tami-Lynn), Aedin Mincks (as Robert), Bill Smitrovich (as Frank), Bretton Manley (as Young John), Patrick Stewart (as Narrator), Norah Jones (as herself), Sam J. Jones (as himself), and Tom Skerritt (as himself). Coming Soon from; Universal Pictures, Media Rights Capital, and Fuzzy Door Productions. Rated R for; Drug Use, Adult Language, and Crude Sexual Content. Read HOLLYWOOD JUNKET’s article, “TED 2012 Stars in Hollywood at Red Carpet Movie Premiere!” Opens in theaters Friday, June 29, 2012 get your tickets now and ENJOY THE SHOW! Check Out HOLLYWOOD JUNKET’s New Movies!